Settled in three separate parts, the City of Albina is generally categorized in terms of Lower, Central, or Upper Albina. 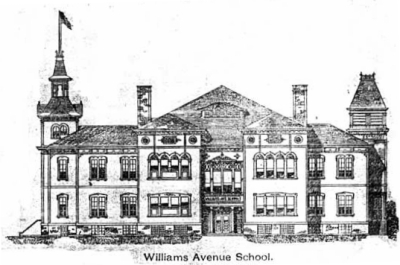 A 1909 Promotional booklet of the area cites the demarcations as follows: Lower Albina refers to the area from the Willamette River to Mississippi Avenue; Central Albina follows Mississippi Avenue, Russell Street and Williams Avenue; and Upper Albina consists of the area north of the intersection of Russell and Williams Avenue, up to Martin Luther King, Jr. Boulevard. 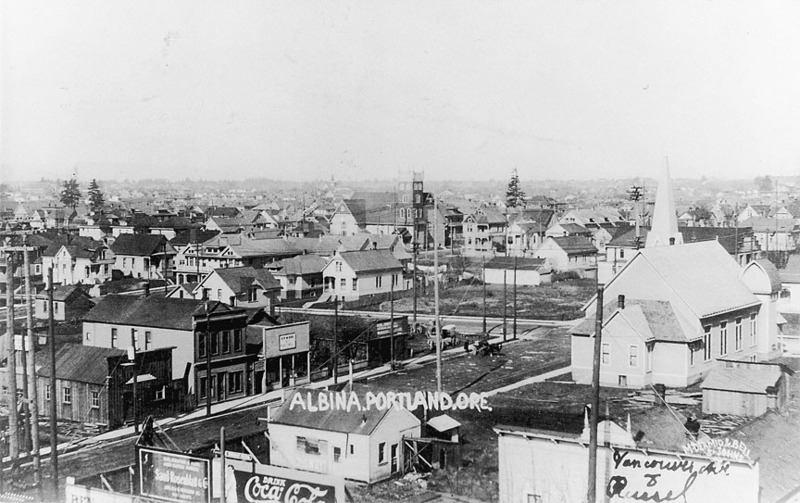 (2) As a whole, the boundaries of the original City of Albina are comparable to today’s Eliot neighborhood. These town pioneers were correct in predicting the desirability of the area. 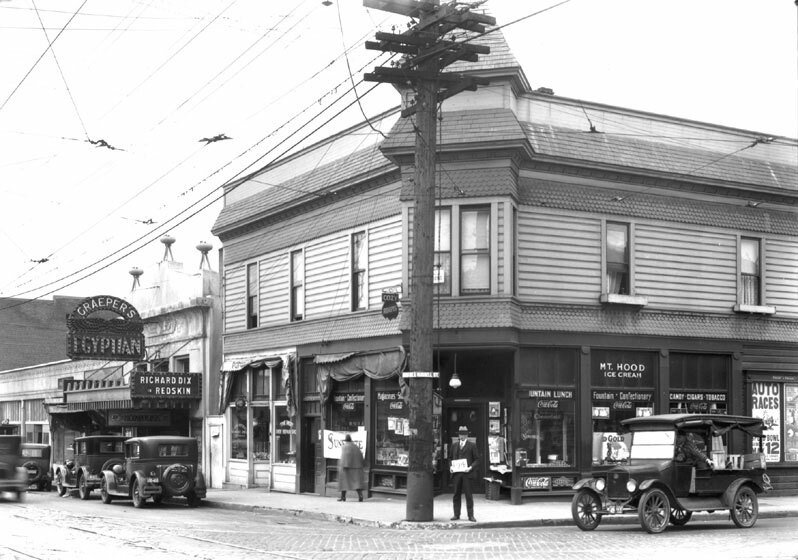 Like many of Portland’s “movers and shakers’ of the time, these early investors where primarily interested in exploiting the economic opportunities of the area. (6) While Williams platted the community’s general dimensions, Russell, who had controlling interest in the venture, oversaw Albina’s development. Russell eagerly began work on the new town. He built a sawmill and shipyard along the river’s edge, organized machine and engine shops, and constructed a grand mansion for himself. Things went well for Russell. In 1873 he was able to negotiate a contract with the U.S. Government to build a $92,000 revenue cutter in his ship yard. Russell had dreams of overtaking the nearby City of Portland where a fire that same year had destroyed a large portion of its business district. He believed that Albina’s future was to be the “premier city of the Pacific Northwest”. (7) Unfortunately, he failed to see his dreams come true. Because Russell has invested all of his savings and borrowed heavily, the bank panic of 1873 was disastrous for him. Unable to pay the interest on his mortgaged properties, Russell left town and moved his family to San Francisco. In 1881 Albina was selected to house the Oregon Railroad and Navigation Company roundhouses and machine shops. By 1886 there was a regular ferry service , a saw mill and other large corporate businesses. Few cities in America were as dominated by corporate interests as was Albina. In the months preceding the consolidation of July 6, 1891 many Portlanders felt their city was poised for greatness. For several years, the consolidation of Portland with East Portland and Albina had increasingly been advocated. The population density of West Portland had reached 6,230 to the square mile, an alarmingly high figure for people not accustomed to being crowded together. (10) The consolidation would have made Portland a city of some 25 square miles in area. Beginning in the 1880s and into the teens, Albina would continue to absorb an increasing number of immigrants relative to the rest of the city. Predominantly from eastern Europe, immigrants from Italy, Greece, Hungary, Poland, Russia would join established immigrants from Germany and Ireland, as well as a Scandinavian community that had settled along the corridor of NE Seventh Avenue. The Albina area would come to serve as a gateway for immigrants newly arriving to Portland. The second wave of ethnic migration to the Albina district transpired in the early 1900s when Portland’s African-American population began migrating to the east side. Blacks were lured to Albina by the possibility of jobs in the railroad industry, the most consistent employer of African-American laborers. By 1909, five transcontinental rail lines (Southern Pacific, Santa Fe, Union Pacific, Northern Pacific, and Great Northern) ran through the heart of inner northeast Portland. Segregated housing patterns emerged as another expression of popular racial attitudes. Before the early 1900s, African-Americans had generally been able to live in all parts of Portland, but the resurgence of anti-black opinion made it increasingly difficult for blacks to purchase homes or rent apartments in the areas they desired. The Portland Realty Board even included a provision within their code of ethics that prohibited any of their members from selling property to blacks or Asians, with the explanation that such sales resulted in the depreciation of property values.When the number of African-Americans migrating to the east side began to grow, realtors reacted by establishing parameters that would restrict black settlement. Increasingly, those boundaries mirrored those of the Albina area. World War II and the years following produced an infusion of African-Americans in Portland., roughly 15,000, mostly from the nation’s south central states. They were brought in to support the shipbuilding industry that arose in Portland because of the war. This new wave of workers also produced a housing shortage. Emergency housing was constructed in Guilds Lake in northwest Portland and Vanport in north Portland. While the black population of Albina had increased to around 3,000 in 1944, most of the 13,000 newcomers found apartments in the defense housing projects , such as Vanport. When the war ended many of the workers, black and white, took their families and left the area looking for work. Those blacks that stayed, remained living in the temporary housing which was supposed to be razed after the war. This created a problem for the city government because it would have required that the residents move elsewhere, and no one wanted them. (22) On May 30, 1948 Vanport was destroyed by flood. While this disaster resolved a dilemma for the city it left close to 19,000 people without homes. Unfortunately, hardly any public assistance was extended to the victims. Instead, they had to rely on community churches and charitable organizations for aid. For the 6,000 blacks that had been residing at Vanport, there was little incentive to remain in Portland. Those that still stayed on found that in segregated Portland, the only place to find homes was in the Albina area, giving rise to the third wave of ethnic migration to the area. Portland’s housing segregation was helped by the canon of professional ethics promoted by the Portland Realty Board which provided for expulsion of any member who encouraged a minority family to move into a white neighborhood. The face of any community changes over time. However, the Eliot neighborhood witnessed a transformation in less than 20 years that is exceeded in Portland only by the changes that occurred in South Portland. In 1950 Albina was a rundown, but vibrant community. Between then and 1980, many factors came to bear on the area. The growing popularity of cars as America’s favorite means of transportation and the city’s need to accommodate it, urban renewal and race relations all played a part in this process. In the mid 1950s the decision was made to build the Portland Coliseum. After much wrangling a site between the Steel and Broadway Bridges was selected. “The choice had the side effect of clearing the southern end of Portland’s black neighborhood and increasing the attractiveness of Lloyd Corporation land around the new Lloyd Center shopping complex.” (21) This was the first of several projects that significantly depleted the area of housing in general, but specifically, low income housing. This property had at one time been very desirable residential sites. “This is the original view property of East Portland”. (22) And at the time of demolition, some of the stately houses still stood on the river bank. The second event took place just a few years later when the East Bank and Minnesota Freeways were developed. The path of these roads cut a huge swatch through the Central Albina area. They also created numerous dead end streets which eroded the grid street pattern typical of older urban neighborhoods. By 1965 Portland’s the vicious cycle seemed complete : the construction of I-5 had done for Interstate what it had done for Union. More damage was on the way though, when the Emanuel Hospital Renewal Project was introduced to the community. Basically, Model Cities was concerned with rehabilitating inner city neighborhoods (a term often synonymous with aging and decaying areas inherited by lower income minority groups) by distributing federal monies to those neighborhoods that showed the most need. That year Albina was judged the most economically depressed of the model neighborhoods in Portland and showed the heaviest concentration of blacks. (25) Those findings seemed to convince the Portland Development Commission (PDC) to write off the entire Albina neighborhood for industrial uses alone. For that reason, the Emanuel Hospital project was kept from the Model Cities planning process, although it meant a massive land clearing in the area. Emanuel Hospital, in an effort to stay technologically abreast and competitive, hoped to build a 19-area health campus situated in the heart of old Albina. In order for their plans to reach fruition, large amounts of land-commercial and residential- would have to be cleared. The area that Emanuel Hospital wished to develop had already suffered damages via the construction of the Memorial Coliseum and the development of Lloyd Center. The Emanuel Hospital Renewal Project would destroy what was left by razing the buildings along Russell Street between Vancouver and Williams Avenues that represented the early development of the City of Albina. Housing officials and professional planners ignored the residents’ resistance-which, by this point, had blossomed into public protest-to relocating to other parts of the city. Instead, they were pacified with compensatory benefits but grew bitter when federal budget cuts halted the renewal project, despite their homes having already been razed. To this day, most of the land remains vacant. It was no surprise that Eliot lost almost half of its residents in the period between 1960-1970. The Hill Block Building was another victim of this razing project. 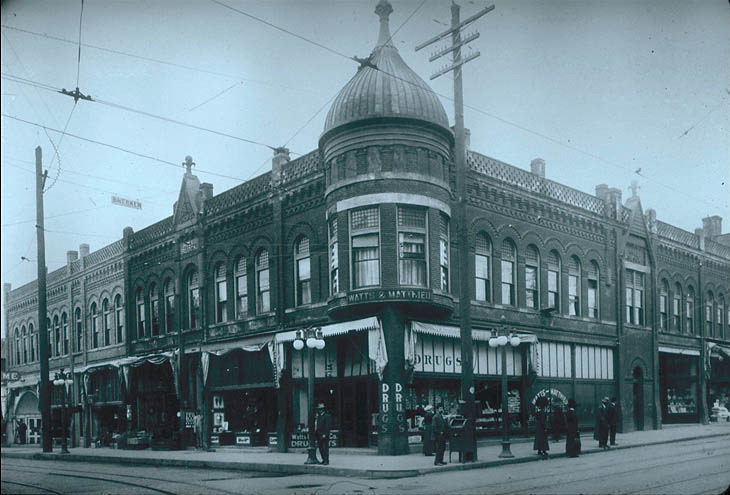 Built by Charles H. Hill, Albina’s first mayor, the structure’s onion dome cupola-one of its most distinctive features- was the only item saved of the building. The cupola can be seen today in the neighborhood’s Dawson Park. It stands as a reminder of what was once the heart of old Albina’s business district. 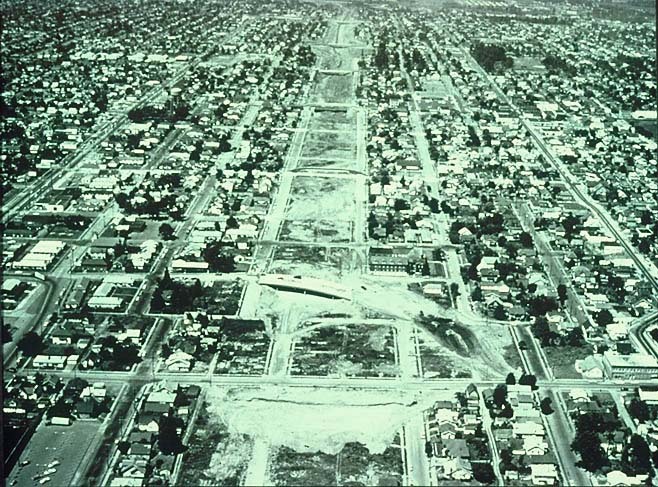 In the 1970s, urban planning experienced a shift in policy. The redevelopment of residential and commercial sites in in blighted areas excited planners and policymakers more than the idea of massive land clearance for industrial uses, as was previously advocated. In the 1980s, that shift in policy and practice would put the Albina community at the top of Portland neighborhoods primed for the introduction of private reinvestment. Plans were made to enhance the physical appearance of the Union Avenue corridor and to improve its function as a transit street. In 1981, a landscaped median was installed to try to meet these goals. Note: The original document contains information about “infill projects”, “projects now in planning” and a neighborhood tour. That content has been omitted due to changes in the neighborhood since it was written.